There's a terrific new modern Indian restaurant in town, called "Fire Safety Door. Do Not Obstruct". That's what it says on the entrance, anyway. Walking through Angel Place, it's difficult to tell the tradesman-like doorway from any other. But go down those workaday stairs to the basement, and suddenly you're on some other, very beautiful, planet, called Indu. Garlands of scarlet flowers and banks of ceremonial brass bells float overhead, and huge vats of fragrant spices line a path that wends past white-jacketed chefs working on Indian flatbreads in an on-view kitchen. There's a smart cocktail bar, a couple of semi-private rooms that evoke mud-bricked railway tunnels, handsome three-quarter-moon booths and another spotlit kitchen that is home to head chef Bimal Kumar. 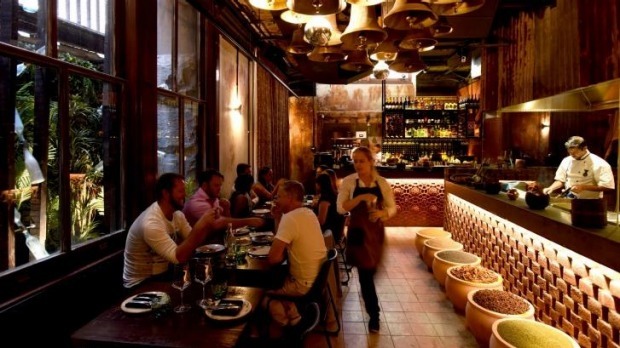 Like owner Dr Sam Prince's previous restaurant offering, Mejico, Indu shows heavy investment in interior design and sensory overload. Beneath the showbiz, however, lies good intent. Prince has designed Indu as an homage to the authentic, generous home cooking of Indian villages, partnering with grassroots organisation Palmera to assist women living in rural villages throughout Sri Lanka. For starters, there is a Sri Lankan take on ceviche ($20), with New Zealand sea bass marinated in coconut vinegar with freshly grated coconut, chilli shreds and crisp-fried string hoppers (lacy pancakes). Just as Mejico adds theatre to the dining experience by preparing tableside guacamole, Indu prepares its Sri Lankan coconut sambol ($14) in a stone mortar at the table, combining freshly grated coconut (a rare treat), red chilli, red onion and devilled cashew nuts, and serving it – a little bizarrely, to a non Sri Lankan – with freshly baked Indian milk buns. There are some real deal-breakers on the subcontinental menu that make it difficult to actually stop eating. One, the slow-cooked red lentil dhal ($12), for instance, which is simultaneously luxurious and homely. Two, the golden, scrunchy folds of flaky paratha bread ($6). 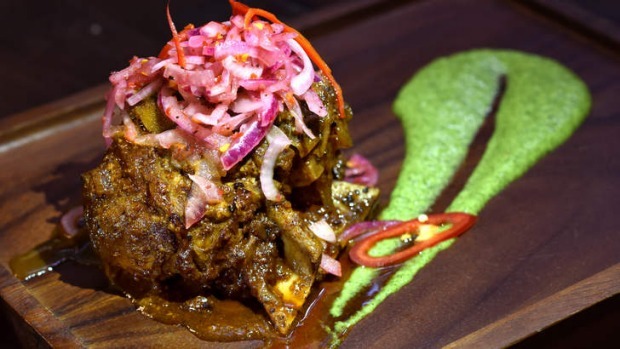 Three, the signature dish of lamb shoulder raan, marinated in a sweetly spiced masala, slowly braised and roasted ($45 half serve), then served on a wooden board with a smear of fresh mint chutney and a topknot of sweet-sour onion sambol. 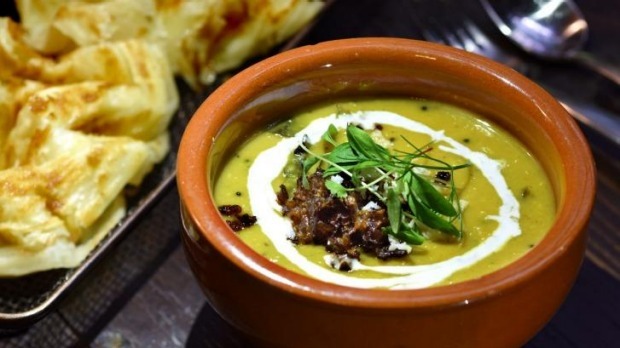 It's well worth bundling your lamb, lentils and paratha orders together for a Sunday roast, Indian village style. Dosai here are soft, buttery crepes, served flat and topped with various fillings; sad news for those addicted to the textural tension of the crisp newspaper roll version. Smoked goat's leg ($18) makes a tip-top topping (good to see goat on a menu), perked up with zucchini raita, pomegranate and a smoky chilli and bacon jam. The drinks list kicks off with custom-made cocktails – the two I try feel unbalanced – then segues into a neat French/Oz wine list that includes a silky, savoury 2013 Chateau de Pizay beaujolais ($15/$64), a workhorse gamay not scared of spice. 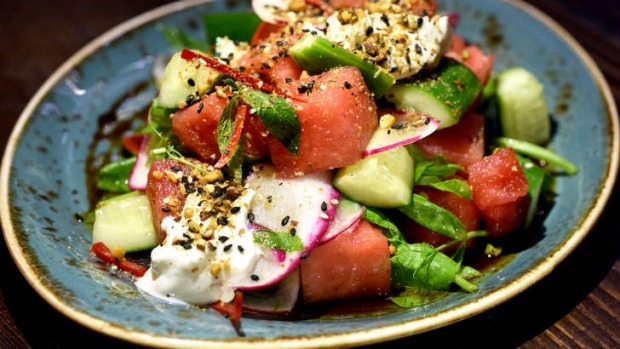 Order without thought and you could be stopped in your tracks with a few too many rich and thick coconut-based sauces, but there are enough salads, raitas and good rice to give you a breather. 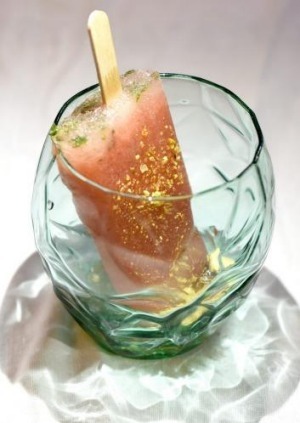 Popsicles of watermelon and fresh mint ($6) are an icy-but-nicey way to finish on a fresh note. It's a curious mix of glamour, ambition, philanthropy, super-cheery serving staff, and a playlist that acknowledges all music stopped when John Lennon died, but Indu's raging enthusiasm for colourful, fragrant Indian and Sri Lankan food is instantly contagious. So feel free to enter, should you find it. Just don't obstruct anything. Best bit: Great use of fresh coconut. Worst bit: It's all a bit hyperactive and needs an edit. Go-to dish: "The great lamb raan", marinated and slow-roasted 48 hours with yoghurt and spice, $45 half serve.